If you’re unfamiliar with social stories, you may be thinking it’s a tale about what you did when you went to the bar with your homies last weekend. The social stories I’m talking about are different. They’re about helping individuals learn proper social behaviors so they don’t get into trouble. They help individuals fit into “normal” society a little easier. They’re also a tool for learning daily living skills and can be used to as strategy reminders for behavioral management. A social story can be about anything from saying hello to bullying behaviors. Proper hygiene to what to expect when going to the store. A social story can benefit with any activity you can think of, including very private matters such as masturbation. 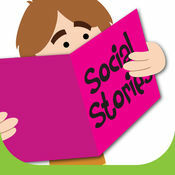 A social story can contain all written words or written dialogue accompanied by clipart or family photos. When I write social stories for RJ, I personalize it even further by giving him an awesome nickname that he likes. RJ’s favorite social story name is “Super FanMan RJ”. I personalize them as much as possible with family photos, photos of our pets, or places we frequent. Identify the person and the activity they’ll be doing. Incorporate their anxiety, but also the proper behavior expected. Address how to achieve the proper behavior. Confirm that once the proper behavior is achieved, the individual will have accomplished something and everyone will be happier. Taking that information, here’s a brief example of a social story for RJ. Super FanMan RJ loves going to different stores. When we’re at the stores, we’ll hear all kinds of different sounds. We might hear smoke alarms while we’re there. Super FanMan RJ doesn’t like smoke alarms. They hurt his ears. When Super FanMan RJ hears a smoke alarm, he’ll have unexpected behaviors like yelling or hitting himself. When that happens, other people will get afraid and not want to talk to Super FanMan RJ. He would be having unexpected behaviors. Super FanMan RJ loves to talk to people, so he should work really hard at having expected behaviors all the time. When Super FanMan RJ has expected behaviors, people love to talk to him! That’s a really quick and basic social story. If I were going to use this story for him, I would incorporate photos of stores, smoke alarms, an angry individual, frightened individuals, then happy people talking with other. When I write social stories for RJ, I’ll sometimes use a 4×6 photo album that holds 24 photos (pages). They work really well to bring one point together without overwhelming him, and we can take them wherever we go. Another example of using social stories is for group settings. I used to drive a special needs bus in our area. Several of the students on the bus didn’t get along – it was like trying to mix oil and water. So I wrote a story giving each student their own special name (Awesome Aries, Heavenly Haley, Jumpin’ Jackson, and of course, Super FanMan RJ). The story discussed how they must all ride the bus together. It briefly touched on frightening sounds or their “triggers”. The story ended on the note how if everyone respected everyone else’s fears, our bus would be the best bus in the whole school. I also worked with the school in that each day we had a peaceful ride home, the kids would receive a sticker. Once they received 10 stickers, they could choose a prize from school. This worked wonderfully and each day the kids would check with me as they exited the bus on whether or not they earned their sticker that day. Social stories can include props. For example, if a child is afraid of ghosts, create their very own ghostbuster kit, complete with a personalized social story, flashlight, and ghost-remover “spray”. We’ll go into writing social stories more next week. If anyone would like a certain subject covered, please feel free to let me know. Perhaps we can put something together! For more information on writing social stories, visit the Michigan State University Extension‘s website for some great information and guidelines.